Unbelievably, it is the middle of September. Autumn has arrived. Where did summer go? I think I ask that question every year as endless hot, dry nights turn into cool, misty mornings. Sunflowers are still smiling, tomato vines are listing as their red fruit plumps and bean pods are swelling with mature seeds. It’s time to harvest the last efforts of our vegetable gardens but what are we going to do with all of that produce? Fall Mums sit on my vegetable washing bench. Mini-pumpkins have been picked then displayed on the Spanish candelabra. 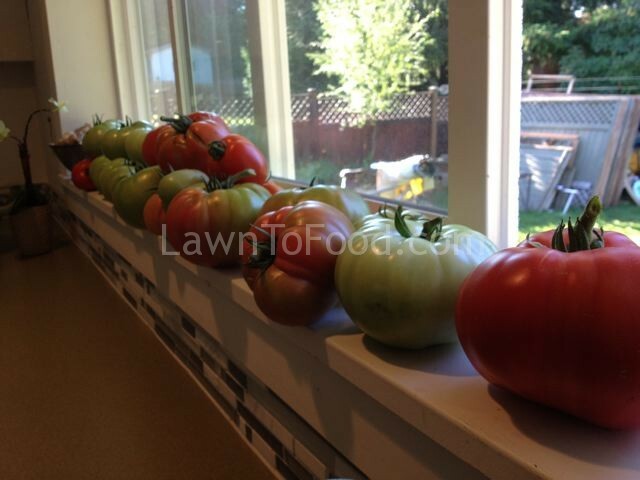 Even though the garden abundance can seem overwhelming, there is no point letting our hard grown food, rot away. If pieces of fruit and vegetables don’t look perfect, they can still be used to make food for our families. 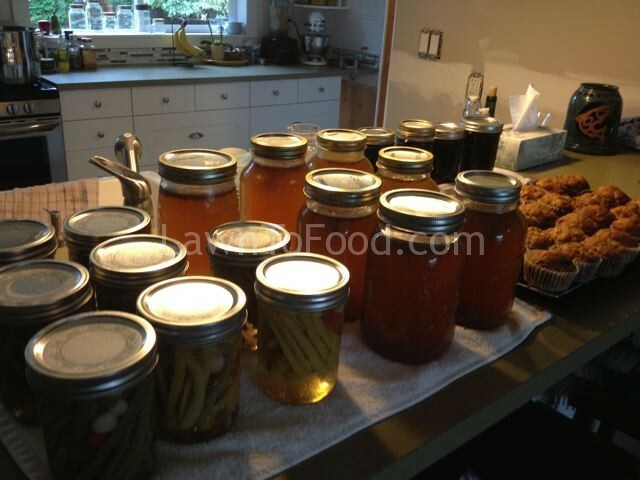 Preserving food for future months is an important way to extend our gardening season. When it gets cold and nasty outdoors, we can turn to our pantries for some summer goodness. I have a couple personal rules for my home preserving. Number #1, I only make as much as we will use, or give as gifts, in a year or two. For example, I know that no one in my family will eat stewed plums because, apparently, they get “too mushy”. So, for me, there is no reason to can quarts and quarts of plums that will just take up space on pantry my shelves, never to be consumed. Instead, I chose to dehydrated Italian plums for lunch fruit snack packs and I cooked up a large batch of Ginger Garlic Sweet & Spicy Plum Sauce, which is a family favorite, for dipping spring rolls. It is gratifying to do what’s right for you and your circumstances. Rule number #2 is that preserving has to be cost and time effective. 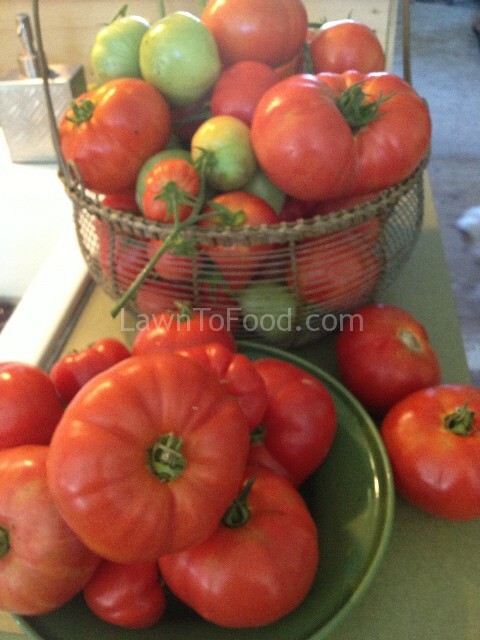 It is worth it for me, time and cost wise, to process all of the tomatoes that our garden can produced. I am more cautious if I have to buy produce, and then spend time and energy to process it. There is a harmony that can be reached, to balance both effort and reeping the reward. 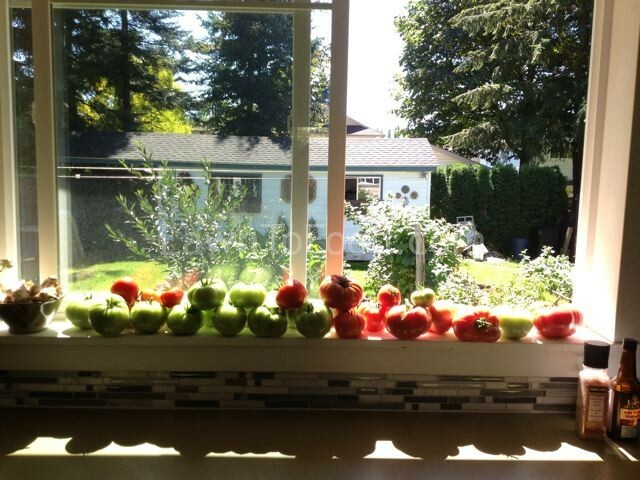 Tomatoes are a very important staple in our household. Freshly chopped for salads, thick sauces and sun-dried slices for Friday night pizza, in vegetable lasagna, Indian curries, with meatballs & spaghetti, and especially in cozy home-made Tomato soup. I’ve calculated that we use about 4 quarts of tomato sauce per month. That’s 48 quarts (4 dozen) per year which is I what I try to process each season. 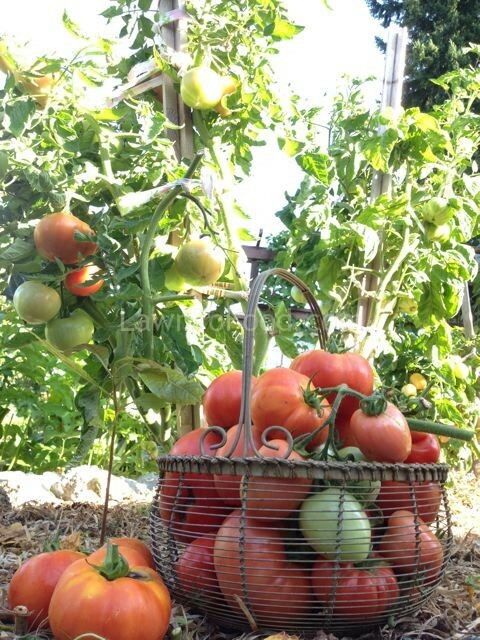 We use another pint per month of tomato goodness in BBQ sauce, salsa, chutneys and relishes. 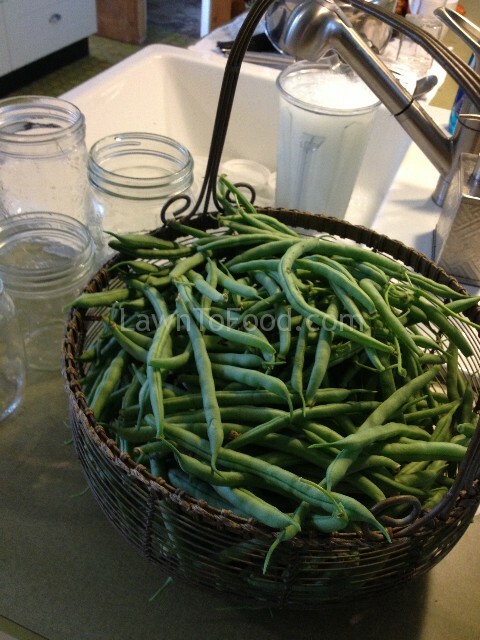 Again, it is important to only produce items that you will use up for before the next canning season. 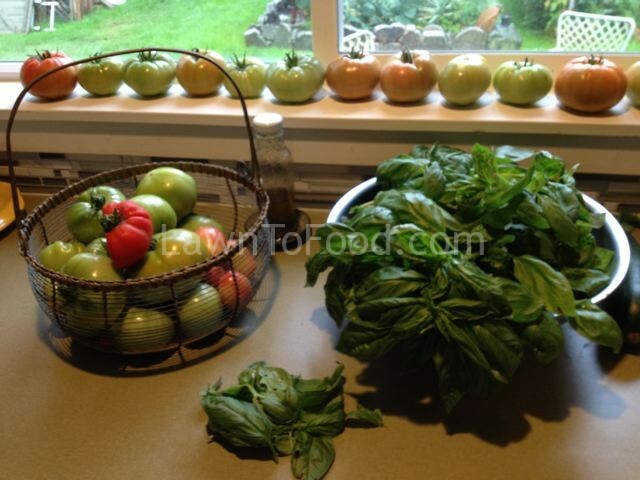 One of 3 Basil harvests in 2013. 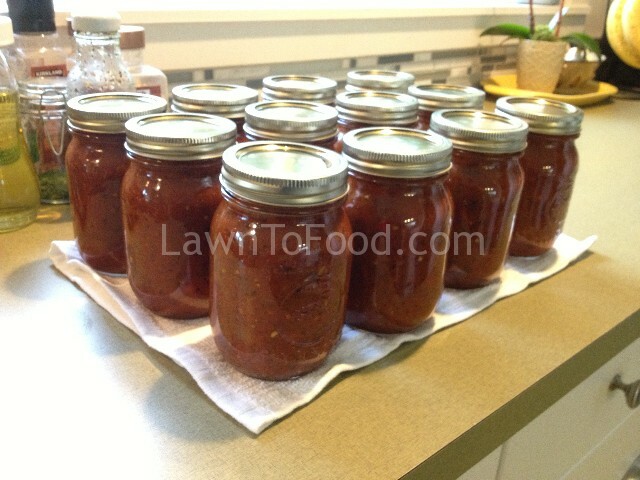 The first was sauced, the 2nd dried for winter salad dressings and the 3rd was used for another batch of tomato sauce. 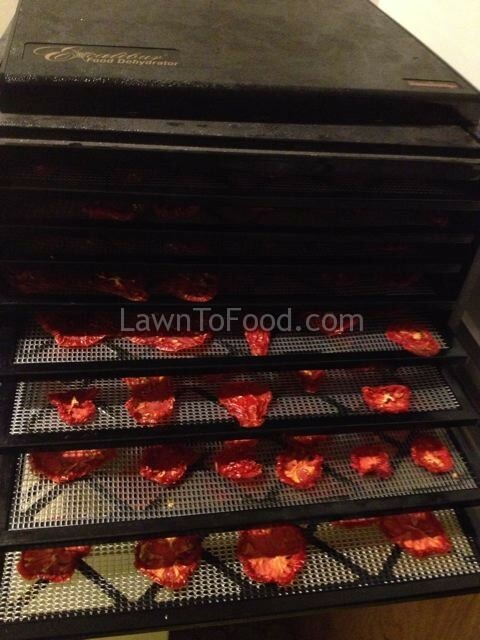 For my tomato sauce, I use the whole tomato, bypassing the need to de-skin and de-seed with a food mill. It’s unconventional, but works fabulously in my opinion. I find that the skin, pulp and seeds, combine to make a beautiful, thick base for my sauces. First, I wash the tomatoes and then cut out the stem bud. 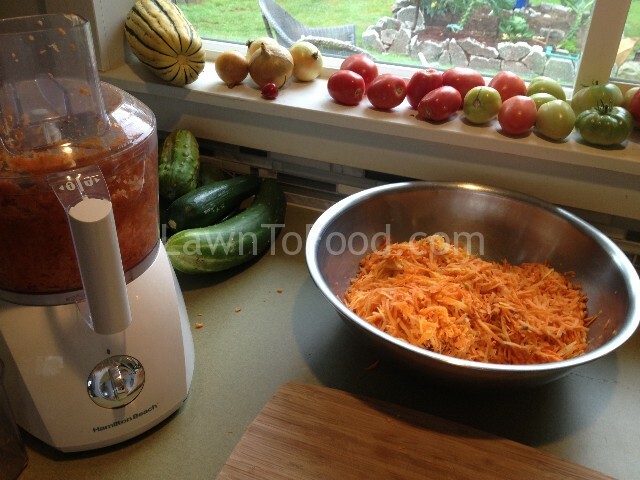 I throw all of the tomatoes in to a blender, or food processor. Then I pour the tomato puree into my stock pot, adding pureed onions and garlic. I let the sauce come to a slow boil for an hour before adding salt, pepper, sugar, and vinegar to taste. I finish the sauce with hand chopped fresh herbs such as oregano, basil or parsley before pouring into sterilized jars. Once I hand tighten the snap lids to the jars, I process my tomato sauce in a pressure cooker per manufacturer’s directions. My favorite thing to create for the winter pantry is salsa. The cool thing about salsa is that you just never know how it’s going to turn out. Each year is a mystery! Even though I roughly stick to the same recipe, some growing seasons the tomatoes are extra sweet or the chillies are extra hot! 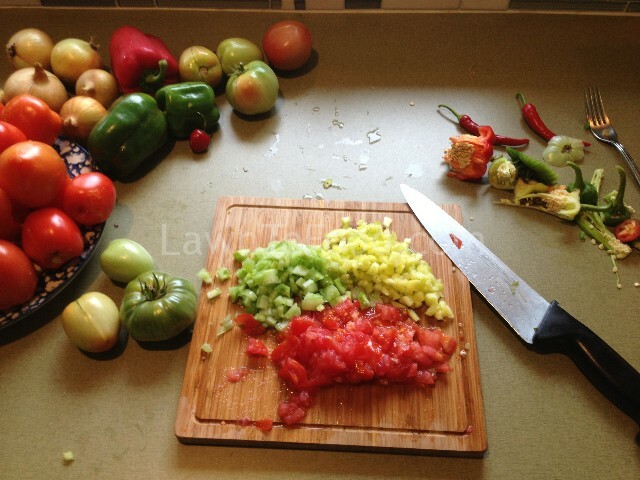 Making salsa in September is perfect for clearing up the garden harvest. 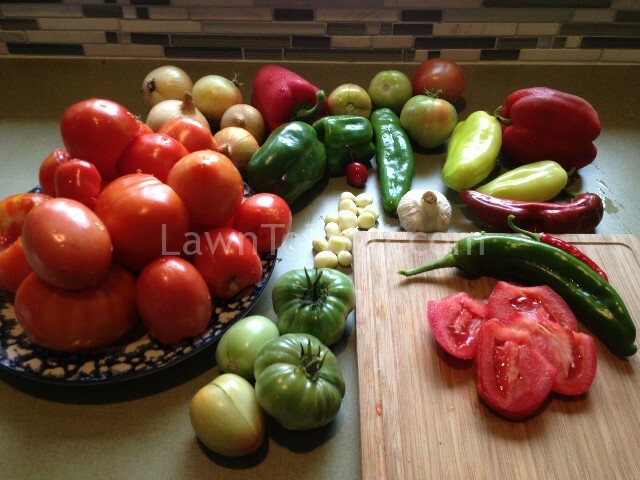 I gather the last of all of my tomatoes, ripe or not, the multi-colored peppers and chillies, as well as onion and garlic bulbs. I start my salsa recipe by making 2 blenders full of pureed tomatoes. I put the tomato puree my stock pot and on to the the stove to heat up. After the tomato puree starts to simmer in the stock pot, I chop the rest of the vegetables into small chunks. I mince the garlic through a press before adding it in. After all the chopped vegetables are added to the simmering tomato puree, I add spices, a dash of vinegar and salt. Fresh cilantro, ground corinander, smoked paprika, paprika, garlic powder, oregano, parsley and celery salt came together to make this batch awesome! This particular amount rendered 12 pints of spicy salsa which were processed in a pressure cooker. This will last the 2 of us a year, even with our frequent social gatherings. 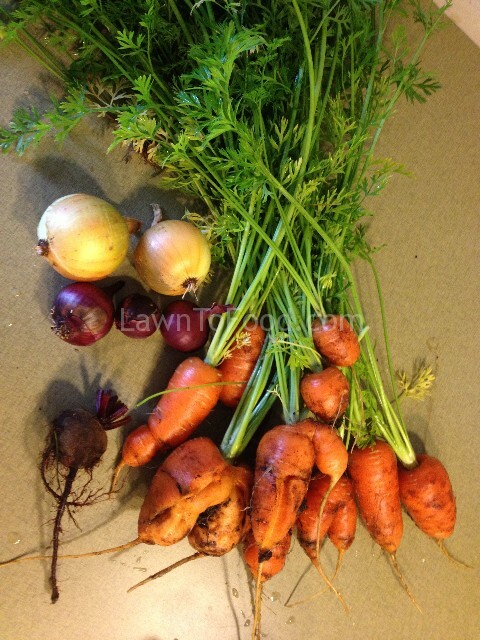 It never fails … every year I have some deformed carrots, minuscule beet roots, cracked onions that won’t survive dry storage and other vegetable anomalities. Just because these veggies look different, doesn’t mean that they can’t be productive. I gather all my oddities at the end of season and brew them into amazing vegetable stocks. 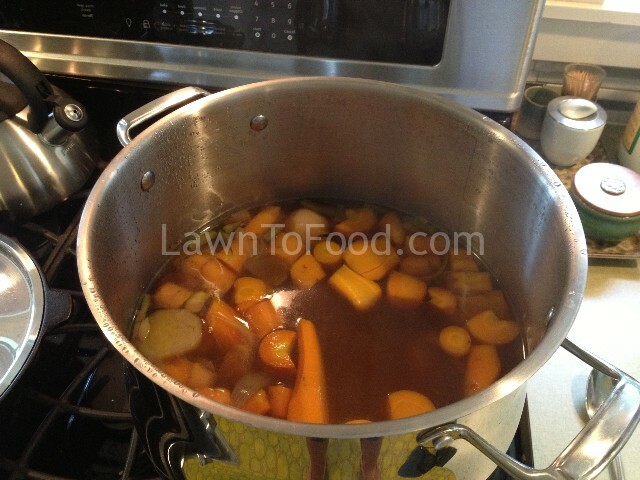 After a good scrub and trim, I add all the odd vegetables into my stock pot with 12-14 quarts of water. Carrot, onion, beet, peppers, and parsnip roots are mixed with 10 black pepper corns, a handful of garlic cloves, and left to stew for an hour or two. The broth will become rich with colour and flavor. Sometimes I add salt at the end of cooking, before processing in the pressure cooker, but other times I leave it plain. I strain the vegetable mixture through a colander before filling sterilized jars and processing them to manufacturers directions. 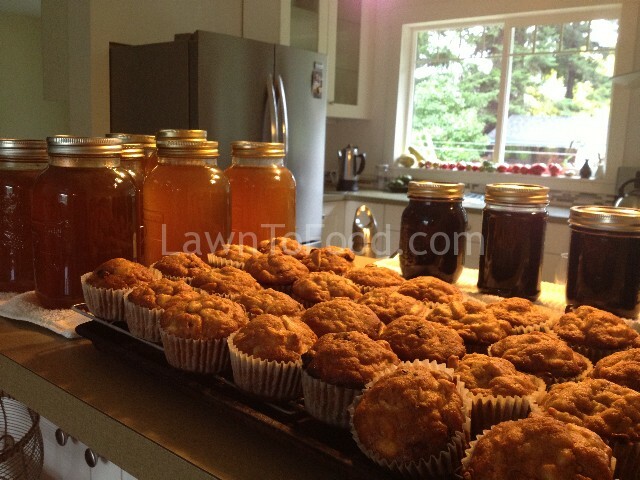 pickled beans, veg broth, grape jelly … mummm muffins. Our extra carrots were grated in the food processor and made into carrot-apple muffins. I baked 5 dozen muffins that morning, which translated into 60 individuals … wrapped, frozen and ready for work day lunches. Lastly, (but not leastly), I was given a couple of flats of yellow plums, that a friend had picked locally. I also had several bowls of yellow cherry tomatoes from our own garden. What was I going to do with those items?? Humm? That evening I was planing to make some curried-coconut chicken and rice for dinner. A mango chutney would go great with that menu. 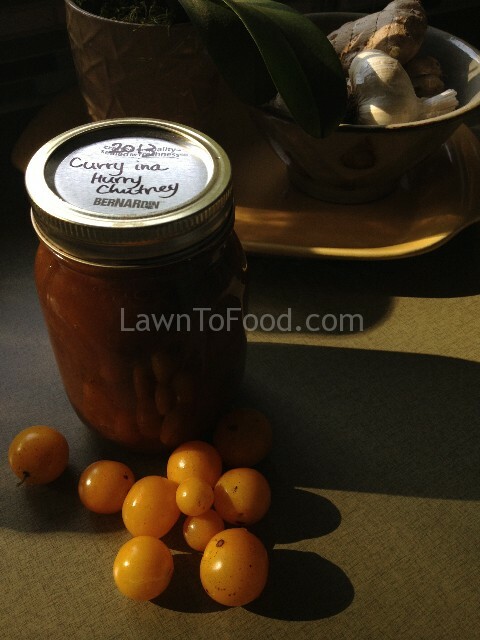 What if I could make a sweet-aromatic-chutney out of yellow plums and cherry tomatoes? … so that’s what I did!! It turned out amazingly well and is a super compliment to any spicy Indian-inspired meal. Check out “Company’s Coming” online recipes to get the ingredient proportions correct and then create your own surprising preserves. 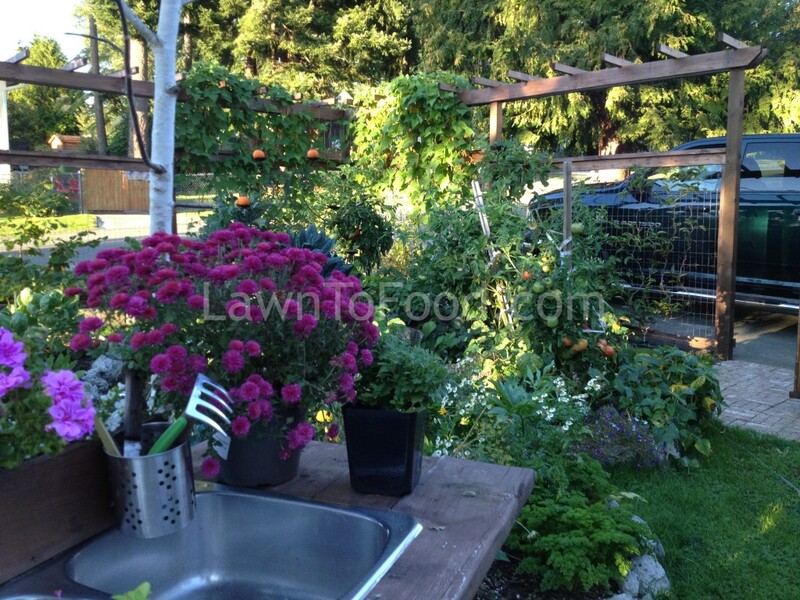 This entry was posted in Fresh Vegetable Ideas, Growing Food, Let's Eat, Preserving & Using Preserves and tagged carrots, harvest, muffins, preserve, tomatoes by Lynda. Bookmark the permalink.